Before investigating the benefits of centrifugal air compressors, it is important to understand the technology behind the compressor. Centrifugal, sometimes referred to as dynamic compressors, work by transferring kinetic energy from a rotating impeller into potential energy (pressure) in the diffuser. As an impeller accelerates the air, a radial diffuser converts the air velocity into pressure converting kinetic energy into increased pressure. Centrifugal compressors typically feature multiple stages within the design. Between each stage, the air is cooled with an intercooler before moving on to the next stage which also increases the compressor efficiency. Due to the continuous flow through the multiple stages, centrifugal compressors are designed to thrive with higher capacities and are best suited for applications above 200 total horsepower. Today’s industrial manufacturing environment is extremely competitive, requiring companies to constantly search for cost-saving opportunities and better efficiencies. 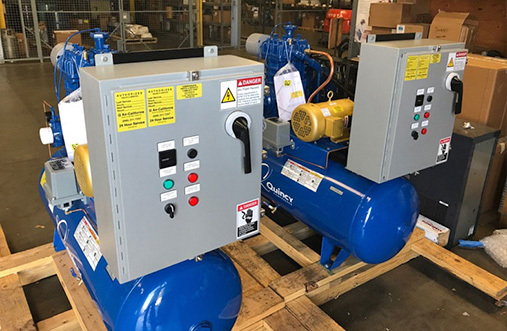 In many cases, manufacturers find that centrifugal air compressors are a successful method for reducing the overall plant costs involved in supplying compressed air. This entry was posted in Educational, Industrial Air Compressors, News. Bookmark the permalink.